A woman dancing in her jingle dress is believed to have great powers to heal. View photos of the Madeline Island Jingle Dress Project here. November is National Native American Heritage Month. Beyond a vague, feel-good notion about Pilgrims and Indians sitting down for Thanksgiving dinner, however, Indian Country and Native peoples are invisible to most Americans. “Native people simply don’t exist in the world they see in front of them every day,” said Barbara With, a non-Native woman who lives on Madeline Island in Wisconsin. “We can’t know people if we don’t understand their history and stories,” she said. Now known as Madeline Island, Mooningwaanikaaning (the place of the yellow-breasted flickers) is the largest of the Apostle Islands located in the Wisconsin area of Lake Superior. For most visitors, the quiet, picturesque little island’s history and place in Ojibwe culture is a distant bit of obscure knowledge. The significance in Ojibwe culture of Mooningwaanikaaning cannot be overstated. Winona LaDuke, well-known activist of the White Earth Ojibwe tribe once described the island as the Jerusalem for Ojibwe people. 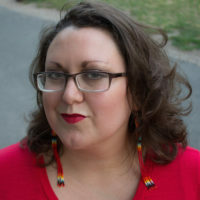 “For Ojibwe women, our feet grow right into the ground here on Mooningwaanikaaning,” said Katherine Morrisseau of the Red Cliff Band of Ojibwe. “We wanted people to learn about the island’s history, as well as its importance for contemporary Ojibwe people,” With noted. Today, there are seven bands or reservations of Ojibwe people in Wisconsin and many bands throughout Minnesota, Michigan, and Canada. 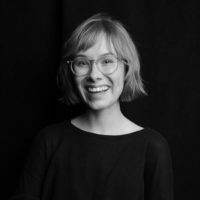 “Rather than hold a conference or formalized teaching event, we decided to do art as a means to immerse people in the power and significance of this place,” she said. So, part performance art, part spiritual icon, the Madeline Island Jingle Dress Project was born in the spring of 2018. The product of which debuted at the end of September on Madeline Island. The date and place are especially significant for Ojibwe people, who according to oral tradition, migrated to the region from lands near present day Nova Scotia over 800 years ago. It’s said that they journeyed to the Great Lakes region “where the food grows on the water,” a reference to wild rice, a staple for Ojibwe. And they conducted their first ceremony of the Grand Medicine Society on the northern shore of Madeline Island. It was also here in 1854 that Chief Buffalo or Beshike, the great Ojibwe diplomat, organized Ojibwe leaders throughout the Great Lakes region to sign with the federal government the Treaty of La Pointe, which prevented the tribe’s removal to west of the Mississippi. The treaty established reservations for several bands of Ojibwe, ensured they would remain on their traditional lands, and guaranteed their rights to hunt, fish, and gather in the ceded territories in perpetuity. However, in the 1830s and 1840s, timber and mining interests pushed the federal government to remove Ojibwe from their lands. Commercial hunger for the tribes’ resources resulted in the infamous 1850 Sandy Lake Tragedy when Ojibwe were lured by Indian agents to an area west of the Mississippi near Sandy Lake in Minnesota. U.S. government agents serving in President Zachary Taylor’s administration promised a full payout of annual annuities, supplies, and provisions if tribal members traveled to the barren location. The Ojibwe soon found that the government’s food and supplies were inadequate and mostly spoiled. Nearly 500 people died of starvation or exposure at Sandy Lake or during the journey back home to Wisconsin. Bob Buffalo, descendant of Chief Buffalo, described Sandy Lake as the Ojibwe “trail of tears.” The Trail of Tears is commonly used to describe the forced removal of Cherokee people in 1838 from their lands. More than 4,000 people died during the forced march from their lands in Georgia to reservations in Oklahoma. Several tribes in the United States shared similar experiences during instances of forced removal from their lands as part of the Indian Removal Act of 1830. It seems likely that without Chief Buffalo’s great journey of 1852 to meet and smoke a pipe with then-President Millard Fillmore in Washington, D.C., the 1854 Treaty of La Pointe would not have been enacted and the Ojibwe would have shared the same fate as other tribes forced from their homelands. Ironically, however, few Native people can afford to live on or even visit the island, located about 2.5 miles from the mainland. This emblem of Ojibwe tenacity and survival is not a part of reservation lands. The average annual household income of Island residents is nearly $70,000, according to Point2Homes. And the rate of poverty for Native Americans in the state is 20 percent, as compared to 12 percent for the general population, according to the Wisconsin Health Services. Therefore, the $39.00 round-trip ferry ride effectively cuts most Ojibwe off from one of their most sacred sites. Natives and non-Natives may physically live a few miles from each other in the region, but culturally they live an ocean apart. The ancestral pain from the Sandy Lake Tragedy, the subsequent loss of land and culture, and the present-day fallout from federal policies designed to eradicate and assimilate Native peoples lingers on for many Ojibwe people. The ongoing struggle for Native people’s survival recently prompted the Bad River Band, who still own the small parcel of land guaranteed to them by the Treaty of La Pointe, to take the land back from the wealthy white cabin owners who had inhabited the island. In 1967, the Bad River tribe, desperate for income, leased 17 acres of prime lakefront property from their 200-acre parcel to non-Natives for about $5,000 per year for 50 years. The non-Natives formed the Amnicon Bay Association and sublet the land to 18 individuals who built cabins along the bay. The tribe periodically renegotiated the rate of the lease; one of the original leaseholders, Peggy Swarz, estimated that over the duration of the lease, the association paid the tribe over $2 million. In a 2014 interview, Swarz was confident that the tribe, unable to pass up the easy income, would renew the lease and added, “I don’t think they’d fit in socially here on the Island.” But in the fall of 2017, the Bad River people decided not to renew the lease; they took back their sacred land. The non-Native cabin owners, per the lease agreement, left their cabins behind and turned over their keys to the Ojibwe. “That view is like looking out at an ocean, and reminds us of our migration story, of our journey from the Atlantic Ocean; that is part of why our elders insisted on maintaining ownership of this land,” said Edith Leoso, Bad River Tribal Historic Preservation officer. According to Bad River tribal Chairman Mike Wiggins taking the Amnicon land back is a potent expression of not only tribal sovereignty but also of Ojibwe tradition and values. Indeed, the relationship between Native Americans and the U.S. government remains fraught and immediate as tribes still battle to ensure that the federal government keeps treaty promises and recognizes tribal sovereignty. The Indian Child Welfare Act in which tribes have authority over their own children, and guarantees of health care, and education are a few examples. Building a bridge between the communities has required acknowledging this painful past and uneasy present. Morrisseau suggested using the female power of the jingle dress as a means to help educate non-Natives about the history of the island as well as acknowledge the ambivalence Ojibwe may feel in returning. So, led by Morrisseau, With, community volunteers, and artists took the project to powwows and Native gatherings throughout the region. 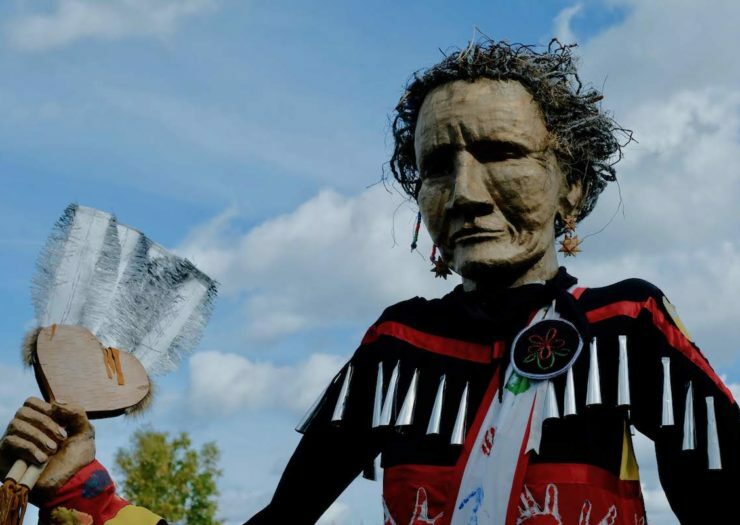 Children, adults, Native, and non-Native worked together this past summer to build a 12-foot jingle dress dancer puppet that would serve as a healing and conspicuous symbol and reminder of Ojibwe history and presence. The puppet, operated by real-life jingle dress dancer Fawn Youngbear-Tibbetts of the White Earth Band of Ojibwe, also serves as an education ambassador. “We want to challenge teachers in Wisconsin to teach accurate history that includes Native peoples,” Morrisseau said. Although the Wisconsin Mandatory Act 31 requires all schools to teach accurate Native American history, many Native people are disappointed by the state’s efforts, according to Morrisseau. “We will take the dancer around the state to schools and communities as a reminder to include our history in their curriculum,” she added. Jingle Dress Project creators also worked to republish Early Life Among the Indians: Reminiscences from the Life of Benjamin G. Armstrong. Armstrong accompanied Chief Buffalo to plead the Ojibwe’s case to President Fillmore. The new edition, funded by the La Pointe Center for the Arts on Madeline Island, includes a forward by Chief Buffalo’s great-granddaughter Sandy Gokee. Morrisseau hopes that educators can use the book as part of their curriculum. And on Treaty Day, September 30, Youngbear-Tibbetts wore the 30-pound dress and danced a healing dance along with several other jingle dress dancers. Native and non-Native people listened as Chief Buffalo’s descendants shared the great migration story, the painful events at Sandy Lake, and the long history of the tribe’s exclusion from the island. Tribal leaders also described the role the treaty has played in ensuring Ojibwe land, culture, and language are still here today. “If Native people are hurting, we don’t ask them what’s wrong; we ask them to tell their story. It’s in the telling that the healing takes place,” Morrisseau noted. Earlier, Morrisseau danced in her own jingle dress along the northern shore of Madeline Island where Ojibwe first held their Grand Medicine Society ceremony. It may have been the first time an Ojibwe woman has danced the healing dance along the sacred shoreline, which for decades had been inhabited by non-Natives. “The role of Native women and of the jingle dress is a conduit to healing. We are telling our stories again; this is the first step,” Morrisseau said.